How do you help people see possibilities when they are worried about what to do next? This has been a big challenge for us recently – and maybe for your organization as well . It's quite difficult to have a substantive and open discussion around what people really want to do in their business. Many people will talk at a polite, social level about how they're doing, but won't go further even when asked. Could people be so unsure about the future that they are reluctant to talk about it for fear it will suddenly come true? Are people so exhausted putting on a brave face and dealing with the challenges every day that they can't see a brighter future? Are people so worried about spending money that they become reluctant to share anything with us for fear that we will suddenly turn purple and seize them with rows of sharp teeth and never let them go? We're not sure - yet we think we've found a possible remedy. We believe we can get real conversations that enable people to rise above the sea of fear out there and truly see the possibilities for their organization. Regardless of whether they decide to do anything about those possibilities. With us or anyone else. And we believe the answer is to ask them to help others. To get to the possibilties that are in the very center of the diagram, we have to bring together the two client-centered realities on the right and bottom, and be transparent about our desire to help on the left. We believe that nearly every organization has significant unmet needs that it has become complacent about (meaning the pain of change is perceived as greater than the pain of staying the same). We believe that nearly every organization is running at no more than 60% of their actual capacity in terms of effective systems and fully engaged people. And we know that our desire to help is real and powerful - it's what gets us out of bed every day. The problems are in the intersections around the possibilities. When we match our desire to help with unmet needs, the response is "Are you saying something is wrong with me? You just want to cause problems to make money." When we match our desire to help with untapped capacity in the organization, the response is "Who cares? Frankly, we are doing just fine with our resources and know that change could make things worse. You just want to cause problems to make money." And when we match unmet needs with untapped capacity, the response is "Can't get there from here. Been there, done that. If we really had all these needs and capacity we would have fixed this long ago. You just want to cause problems to make money." Yet in the very center of all three of these conditions is an amazing triple play. 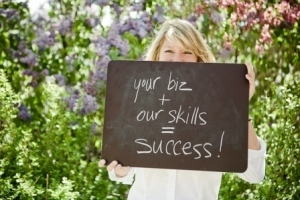 Your needs and capacity + our desire to help = possibilities for your business that could explode your results. And the way we're going to get into these great conversations is to ask for help. That's right - ask people to help us refine a tool to help others see what's possible in their business. We're calling it...Possibility Generator. (Original, I know.) And our goal is to walk 100 companies through the exercise by 1 December 2010. We figure we're going to have to call quite a few companies to hit our goal. "Hi, this is Chris Hutchinson with the Trebuchet Group. Could you spare your top 4 people for 2 hours to help us refine a process we believe has the potential to help a lot of people?" Of course if you'd like to help it's ok for you to call first.